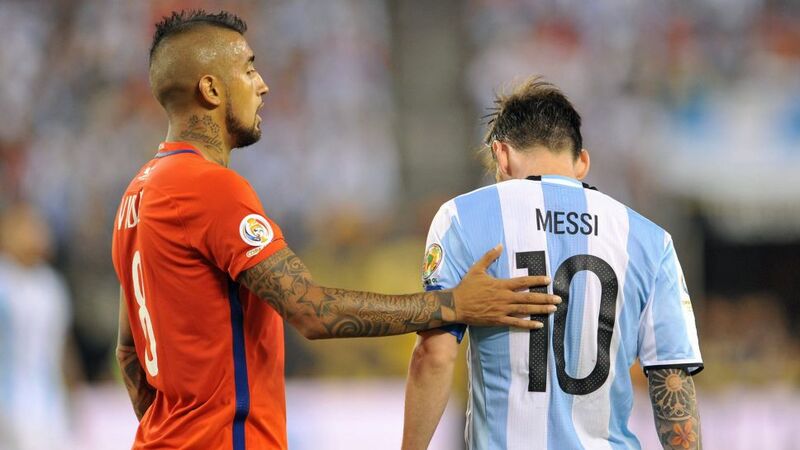 Bayern Munich star Arturo Vidal is perhaps the most high-profile name missing from this summer’s FIFA World Cup in Russia, with his back-to-back Copa America champions Chile failing to qualify, but he is confident La Roja have a better side than Lionel Messi’s Argentina. Both teams stuttered in CONMEBOL qualifying. A draw between Colombia and Peru on the final day cost Chile their participation at the finals by virtue of goal-difference. Argentina, meanwhile, needed a Messi hat-trick against Ecuador to seal their qualification at the last with a 3-1 win in Quito. Argentina beat Chile home and away in their qualification campaign, but Chile emerged victorious against La Albiceleste in the Copa America finals in both 2015 and ’16, and Vidal is confident his national team remain a more potent force than Messi’s. Watch: EVERY Vidal goal and assist from 2017/18! Serial winner Vidal – a league champion in each of his last seven season with Bayern and previously Juventus – will have to wait for his chance to face Messi again. Messi’s Barcelona and Bayern will each contest the International Champions Cup in July and August, but Bayern’s three games will be against Paris Saint-Germain, Juve and Manchester City.